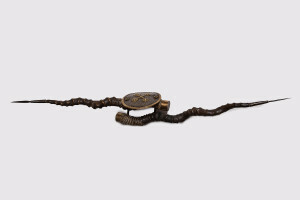 The weapons that were purchased by collectors in the 19-20th centuries at the Indian markets were certainly typologically similar to real weapons, although manufactured as souvenirs and handicrafts. But the quality of information the customer learnt about the name, features, and origin of a weapon type depended on the seller`s knowledge of the weapon. The provided information must have been variable depending on the place of purchase and language spoken by the seller. Thus, the Indian weapons classification was grounded on the classification according to the purchase place and definition of an object by the term which as a matter of fact in most cases had been a generic term for designation of this type of weapon in a local language. 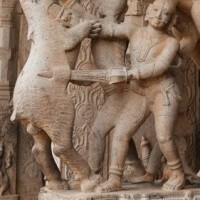 Currently, real facts about the origin, purpose and names of Indian weapons are only to be established on the basis of sparse information from primary sources. Yet in any case, when using an established and long-present classification, it is essential to realize its relativity and conditional character. 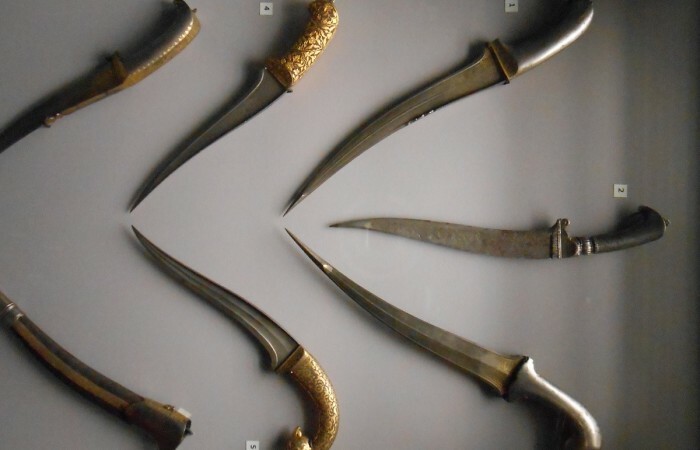 Taking into account the aforementioned, an attempt appears to be interesting to observe Indian daggers from the point of their use – traditional weapons training systems, in which like in any closed specialized system information could be preserved longer and be more accurate. 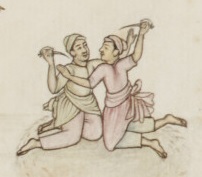 A dagger fight called «bank» was described (Pic. 1). The word «bank» itself means «curved» and indicates the recurved shape of the blade. 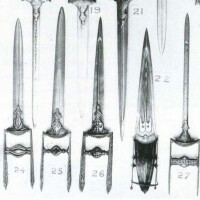 In this regard, it must be clarified that according to numerous descriptions left by the British, as well as the analysis of the survived practices, the Indian technique of using cold bladed weapons differed from that of the Europeans. In particular, the arm was never unbent at elbow, due to which the blows were delivered in circular movements. 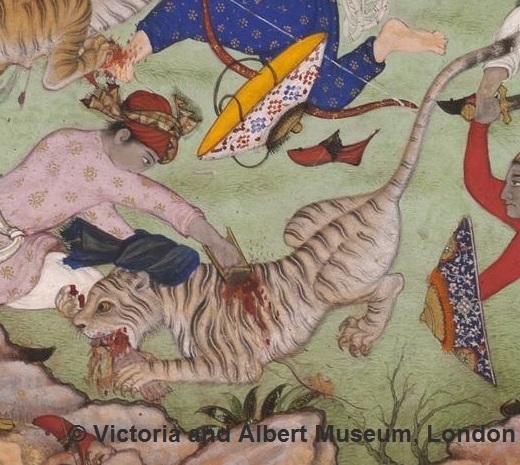 In case of a dagger that implied not piercing, but cutting, «tearing» blows, working as an animal`s claw, which fitted good into the worldview of the Indians, being associated to the tiger`s image (Pic. 2). Such blows did not have to be deadly. In real martial arts a blow struck was normally not to be the only one, unless it was final in a series of consecutive actions. The limbs were always attacked in the first place, making the adversary unable to resist, after which the finishing deadly blow was struck. This technique was employed in martial arts even when using the «jamdhar» push dagger with an H-shaped handle, for which he was seized in a complex grip at the intersection of the cross bar with the side bar, a necessary angle of the blade to the forearm being formed. But most comfortable this technique was in case curved daggers were used, held in reverse grip with the blade pointing down (Pic. 3). In 1897 Bramley P., Deputy Inspector-General of the North-Western Provinces and Oudh Police, delivered a lecture on the Indian swordsmanship before the officers of the 5-th Dragoon Regiment in Meerut. Some examples of cold weapons used by Indians were also presented by him. 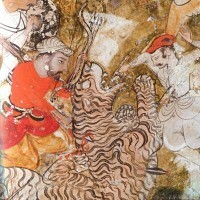 Bramley refers to the dagger fighting art as «bichwa». 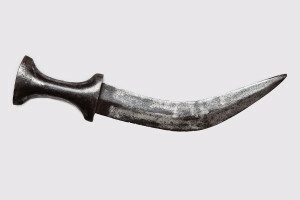 And demonstrates a corresponding dagger «bichwa», not mentioning any of its design features. 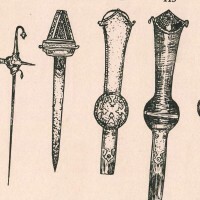 Colonel Baden-Powell also describes the «bichua» dagger as a common dagger featuring a double curved blade and a sword-like guard, meaning an additional protection of the hand in the form of a bow connecting the crossguard and the pommel. 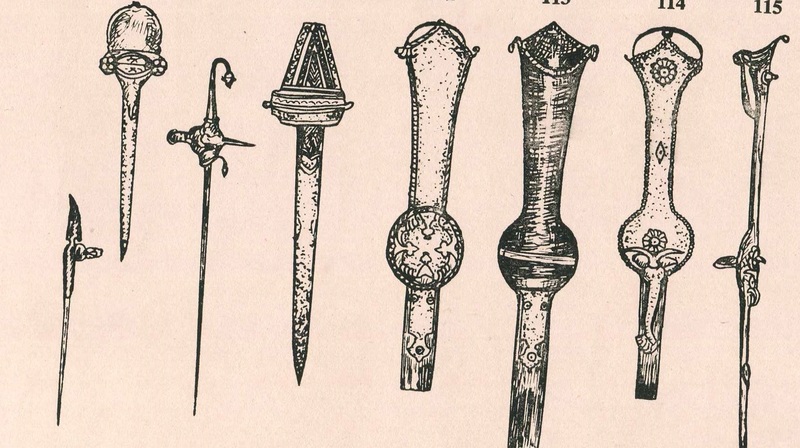 The etymology of the dagger`s name «bichua» is usually traced down to the comparison of its shape to the scorpion`s sting, suggesting that this type of weapon originates from daggers made of one-piece horn, in which a through-hole for the hand was cut. Doubts in such a treatment are possible taking into account how relatively a horn looks like a scorpion`s sting, as well as the differences in pronunciation and spelling of the word «bichua» when defining a scorpion and a dagger type. It should rather be noted that both these words derive from one and the same term meaning «damage» or «cut». 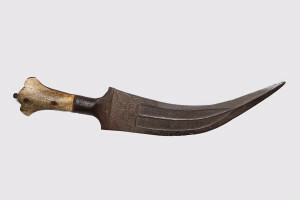 It should be assumed that «bichwa» is the regional name of a dagger with a guard bow (Pic. 4, 5). Jamdhar, the Indian push dagger with an H-shaped handle, is widely known and raises curiosity both by its construction and usage (Pic. 6). It is an established opinion that this type of weapon was mainly intended for piercing the armour. Leaving the question of the armour distribution in India beyond the scope of this article, we would only remark the following. Claude Hugo, who was in India in the second half of the 18th century and observed the Hindu military organization, participant of Maratha-Mysore wars, regards as a rare occurrence: “I saw horsemen with iron armour on; this armour is useful, since it is usually fought with cold weapons in Asia, yet it is very uncomfortable due to the terrible heat and vast distances which have to be covered by cavalry”. During this period and later on a hard-lined quilted jacket stuffed with cotton and clinging to the skin became the most commonly used defense of the Indian warriors. This armour was so tough that the British dragoon sabres could neither cut (as was also the case with the turbans on the heads of the Indians), nor pierce it. Jamdhar was undoubtedly the most comfortable short bladed weapon for thrusting such armour, which was probably the reason for the wide distribution and usage of this type of arm up to the mid 19th century seen not only among the elite. To begin with, we would like to return to the design features of the dagger. The supporters of the version according to which the dagger`s construction and the manner in which it was held were ideal for a strong thrusting blow lose sight of an additional effect also achieved through this handle construction – the ability to withstand the force applied to the hand and arm when a conditional victim attacks a person who defends himself, and the victim`s weight exceeds the weight of the latter. Indeed, a hand swinging a classical dagger or knife for the blow lacks such an effect. So what could be the reason for the use of a weapon which has at once an enhanced armour-piercing and “stopping” feature? The answer lies in the second name of this dagger known in India: the tiger dagger. By its construction, the Jamdhar represents a weapon which is extremely handy for defense in case of attack of a larger sized predator (Pic. 7). The Surgeon-Major Thomas H. Hendley wrote in 1883: “… adapted for thrusting, and makes a wide and dangerous wound, which is enlarged in the act of withdrawing the weapon, as both edges are very sharp. 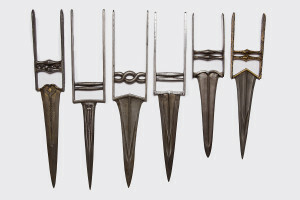 Some katars are made to open like scissors blades, others have two small pistols, and in a third variety the open sides reveal a small point within. All these arrangements are devised to make the wound more horrible, and as, in hand to hand conflicts with tigers and other large savage animals, it is essential to produce a considerable effect at once on the beast, this quality of the kattar, which is often used in such sports, is very advantageous”. 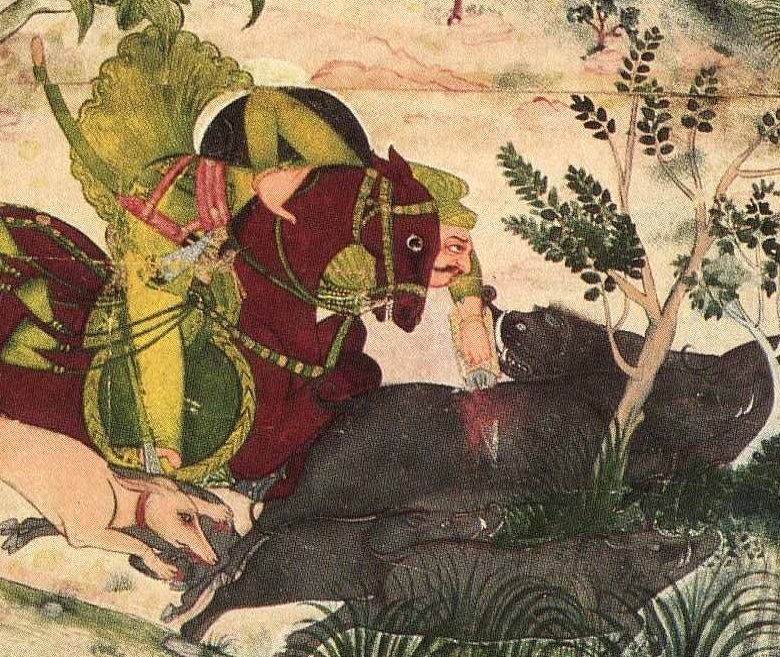 The Jamdhar also provides much more comfort when hitting from top downwards in case a beast attacks the hunter riding a horse or elephant, or the horseman attacks the beast himself (Pic. 8). 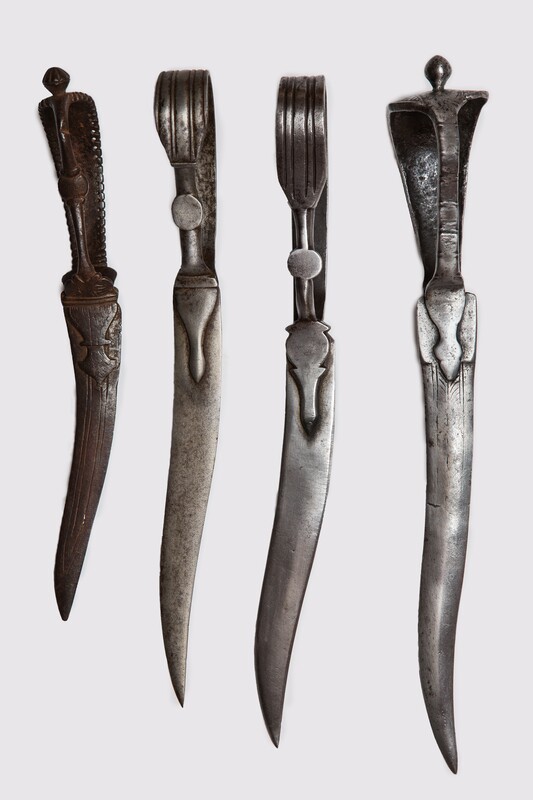 Now, the construction of early South-Indian daggers, which are also referred to in the literature as jamdhar or katar, needs to be highlighted. Concerned are the objects having a long narrow blade, often of European origin (Pic.9). Such a construction most probably correlates with the early forms of the sword with a gauntlet, the earliest examples of such objects to be acknowledged the ones which employ the blade and the gauntlet aligned on one axis on the outside of the wrist; given that, the blade works like the extension of the outside part of the wrist; the hilt is located underneath similar to a shield handle construction, and the general design is much closer to the construction of a shield with a blade than that of a push dagger (Pic.10). Another famous form of South-Indian daggers is similar in its design to North-Indian jamdhar daggers. 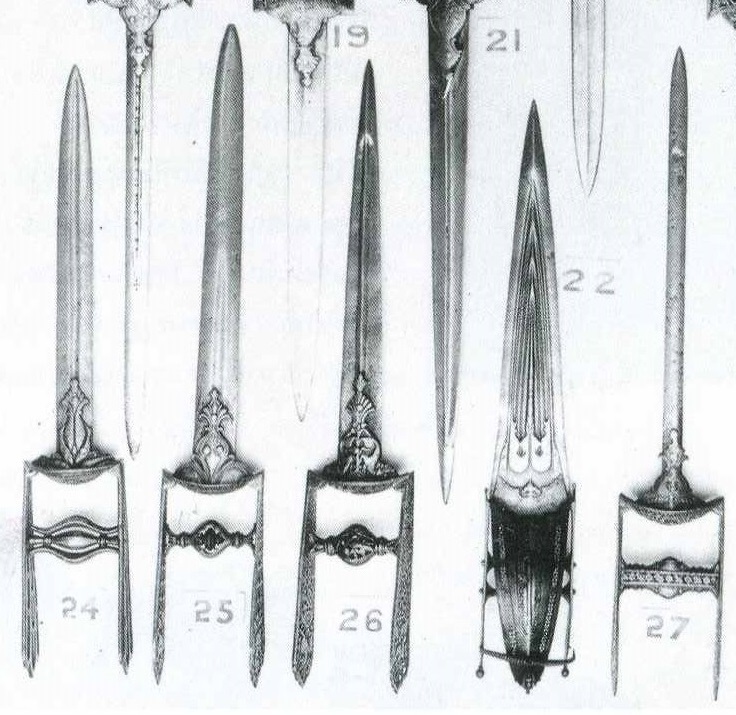 No wonder that this type of daggers was also used for theriomachia (Pic.11). 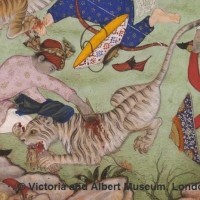 Main weapons for tiger and lion hunting were, of course, the bow and arrows, and later firearms. Yet, a number of incidents are described when a wounded animal attacked a foot hunter, rider, or person hunting from elephant. In this case sabres, staffs and even the buttstocks of toradar musket were used – everything on hand, but still barely suitable for fight in the grasp of a beast. Under a hail of blows thrown on the animal by the arrived warriors, the hunter attacked sometimes died. The toughness of the animal`s skull, skin, and most importantly – strong skeleton muscles left little possibility for defeating such an adversary. 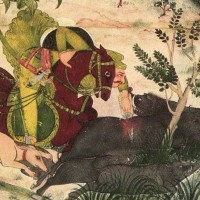 The algorithm of the most adequate actions was found, though: a little round shield or left hand wrapped in thick fabric given into the beast`s mouth for tearing, letting it feel that the victim had already been caught and there was no sense in aiming at a new target for its fangs, and the jamdhar dagger kept in the right hand. Judging from the iconography, specially trained hunt assistants were there ready to face the blow of the furious animal, in case the first person had missed (Pic. 12). 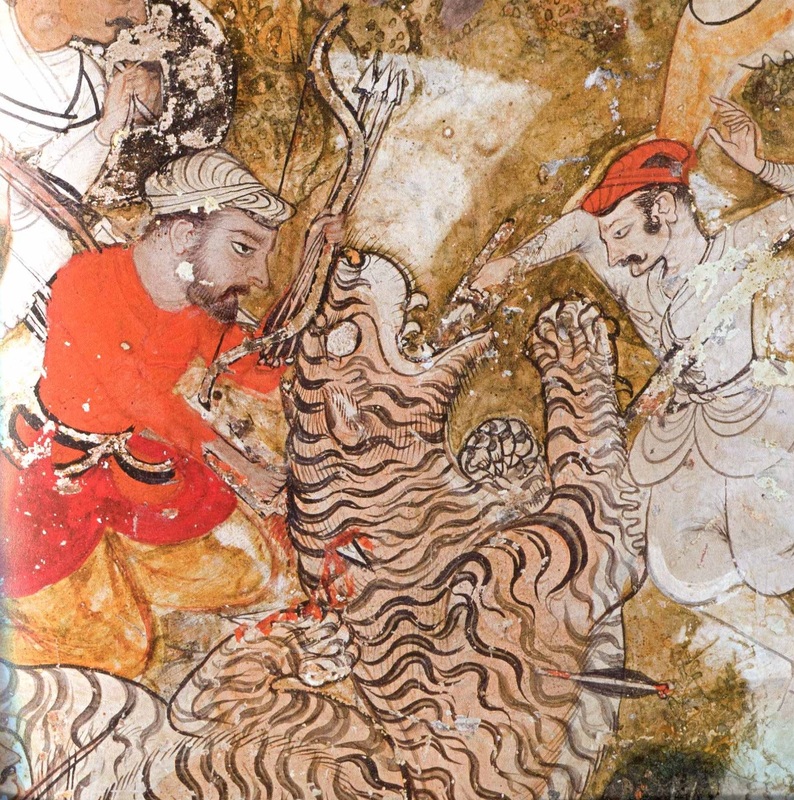 Even in the 16-18th centuries the number of hunts in which Indian nobility would take place significantly exceeded the number of battles in which they participated. It would be reasonable to suppose that the dagger which had initially entered the weapons complex of noblemen as a conventional hunting tool, later started to be carried in everyday life and battles. The pointed above straight two-edge dagger that was used by Indians was known as “katar” (Pic. 13). 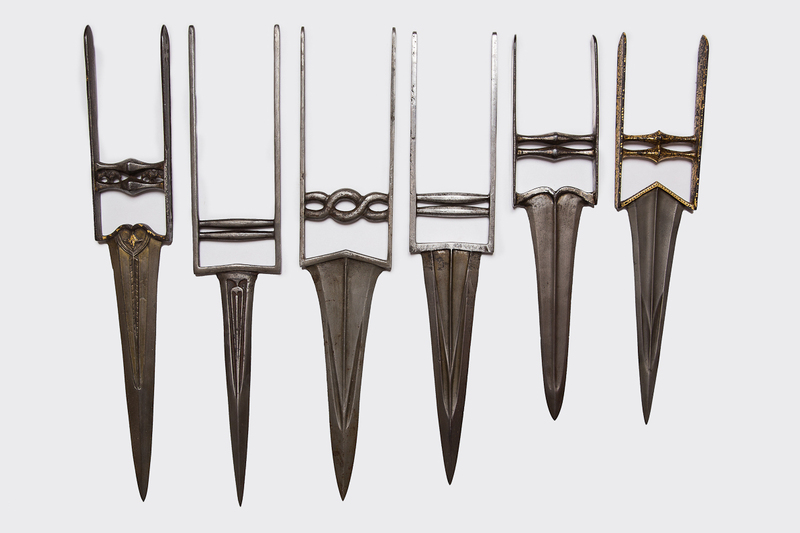 Generally speaking, the word «katar» was a collective term for daggers and derived from the stem «kat» meaning «cut» or «wound». Some authors describe straight «stiletto-like» weapons or objects resembling the dirk (Scotch dagger) by this word. It is noteworthy, the Indian authentic schools of martial arts also made use of straight daggers. 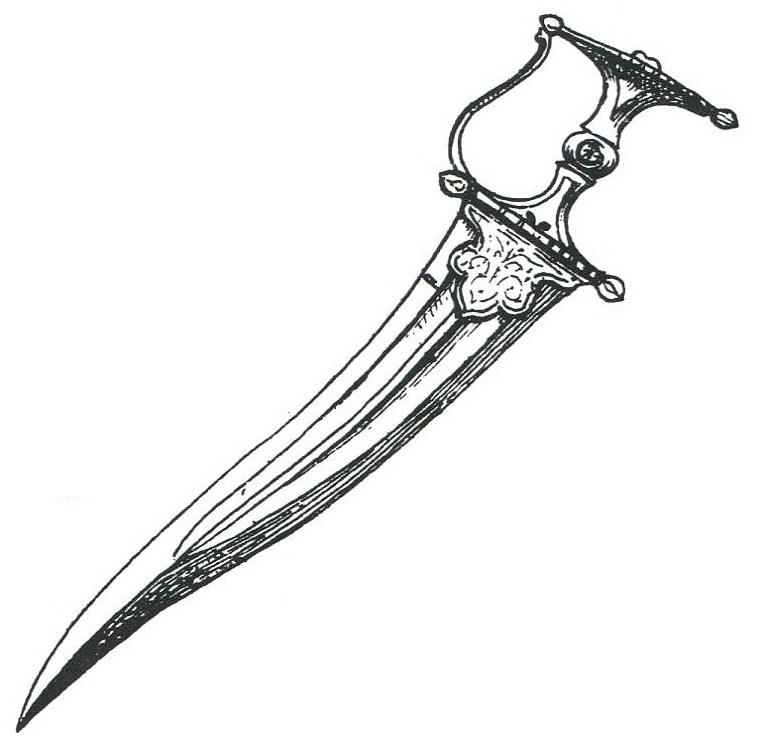 Out short-bladed weapons, a special kind of dagger with two opposite blades was used. The handle of the dagger was between blades (Pic. 14). There is not any early evidence. At the beginning of 19th century there was a describtion of nuked ascetic “who from going quite naked, close shaved, and well rubbed with oil, are so slippery, that no one can seize them, while they force their way with a dagger, pointed at both ends, and held by the middle”. 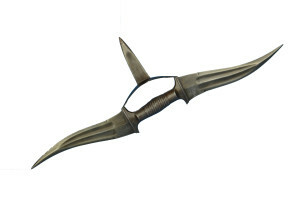 Similar by design was the two-bladed dagger made of two horns of the antelope called “madu” (or “maru”). Till the middle of 20th century the madu was used in martial arts (Pic. 15). All right reserved . Copying materials is possible only with the permission of the author.